By Xah Lee. Date: 2013-01-26 . Last updated: 2019-02-13 . This page shows the most frequently used linux networking commands. How to list all Network Interface? ignore the “lo” one (that's software-based local loopback). The rest are your Network Adapters. “Network Interface” is also known as “Network Adapter”. go to https://www.google.com/, then type “What's my IP address?”. It'll show on top. Or, find your router's IP address first, then use web browser to visit that IP address. Then, the router software will show the info. How to find the IP address of my machine? For each network adapter, its IPv4 address is shown in the line “inet”, and your IPv6 address is shown in “inet6”. How to find my machine's MAC address? To find the MAC address of your machine's network adapter, type ip link. The line with the format “08:00:27:76:bb:55” is the MAC address of that network adapter. Type ip route. The line “default via” contains your router's IP address. Or, type route. The line “default” and the IP in column “Gateway” shows the IP address of router. How to find my router's MAC address? First, find out your router's IP address. Then, type arp -a. How to turn off my network interface? turns network interface named etho0 off. turns network interface named etho0 on. set IP address on network interface “etho0”. set netmask of network interface “etho0”. iproute2 is a collection of utilities for controlling TCP and UDP IP networking and traffic control in Linux, in both IPv4 and IPv6 networks. iproute2 is intended to replace an entire suite of standard Unix networking tools (often called “net-tools”) that were previously used for the tasks of configuring network interfaces, routing tables, and managing the ARP table. iproute2 unifies the syntax for these various commands, which evolved over many years of Unix development. How to show all network adapters? How to find out if a network adapter is on or off? ip link show. If it's on, it'll show “state UP”. If it's off, it'll show “state DOWN”. How to turn on/off a network adapter? to turn on, type sudo ip link name up. Use “down” for off. to show active Network Interface, type ifconfig. to show all Network Interface, type ifconfig -a.
to turn off a Network Interface, type sudo ifconfig name down , where the name is typically “eth0” or “wlan0”. But for wireless network adapter, it may turn on itself after you turn it off. to turn on a Network Interface, type sudo ifconfig name up . used to test the reachability of a host on an Internet Protocol (IP) network and to measure the round-trip time for messages sent from the originating host to a destination computer. Traceroute sends a sequence of Internet Control Message Protocol (ICMP) echo request packets addressed to a destination host. Determining the intermediate routers traversed involves adjusting the time-to-live (TTL), aka hop limit, Internet Protocol parameter. Frequently starting with a value like 128 (Windows) or 64 (Linux), routers decrement this and discard a packet when the TTL value has reached zero, returning the ICMP error message ICMP Time Exceeded. Traceroute works by increasing the TTL value of each successive set of packets sent. The first set of packets sent have a hop limit value of 1, expecting that they are not forwarded by the first router. The next set have a hop limit value of 2, so that the second router will send the error reply. This continues until the destination host receives the packets and returns an ICMP Echo Reply message. 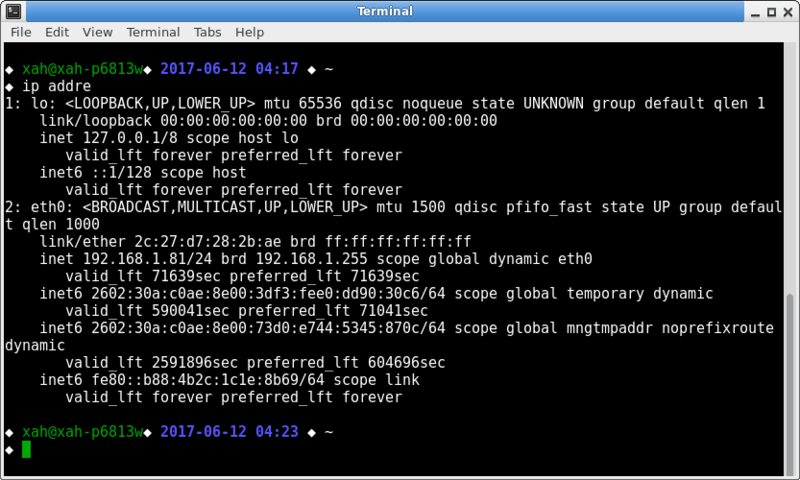 Traceroute uses the returned ICMP messages to produce a list of routers that the packets have traversed. The timestamp values returned for each router along the path are the delay (aka latency) values, typically measured in milliseconds for each packet. on Linux, by default, tracepath and tracepath6 is installed. the traditional command traceroute requires superuser privilege. tracepath doesn't, and has fewer options. netstat. Displays protocol statistics and current TCP/IP network connections. netstat (network statistics) displays network connections (both incoming and outgoing), routing tables, and a number of network interface (network interface controller or software-defined network interface) and network protocol statistics. Route (command) Manipulates network routing tables. route is a command used to view and manipulate the TCP/IP routing table. Manual manipulation of the routing table is characteristic of static routing. Address Resolution Protocol (arp) is a telecommunications protocol used for resolution of network layer addresses into link layer addresses, a critical function in multiple-access networks. ARP was defined by RFC 826 in 1982. It is Internet Standard STD 37. It is also the name of the program for manipulating these addresses in most operating systems. ARP has been implemented in many combinations of network and overlaying internetwork technologies, such as IPv4, Chaosnet, DECnet and Xerox PARC Universal Packet (PUP) using IEEE 802 standards, FDDI, X.25, Frame Relay and Asynchronous Transfer Mode (ATM), IPv4 over IEEE 802.3 and IEEE 802.11 being the most common cases. check the Internet connection to "yahoo.com"
trace the Internet connection to "yahoo.com"
check DNS zone information of "example.com"
nslookup → find the ip address of a domain name. ufw is a simple command line to Linux's firewall features. short intro: Linux: What's Netfilter, iptables, Their Differences?